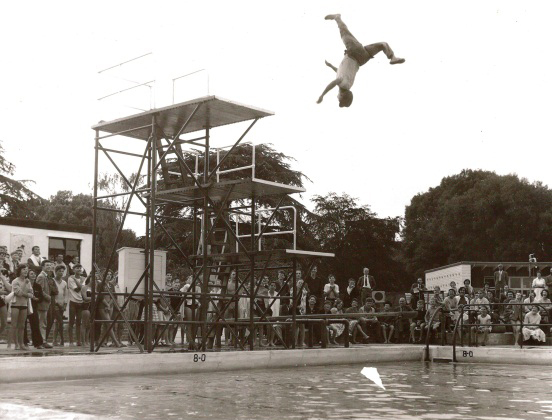 A series of exhibition panels demonstrating the history of one of Somerset’s few remaining lidos, Greenbank Pool in Street, have recently gone on permanent display. 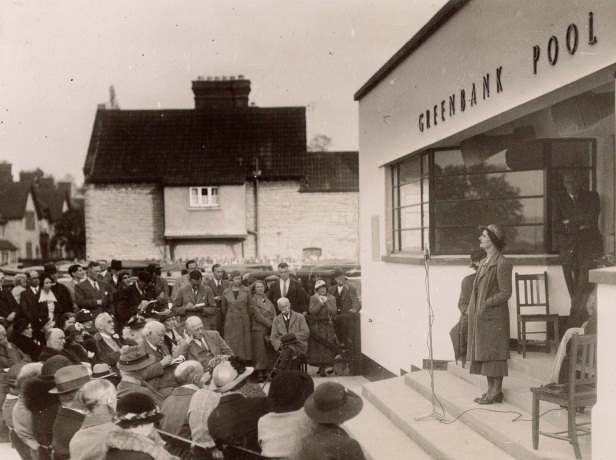 Created using a combination of records and photographs held in the Alfred Gillett Trust Archive and images generously donated by members of the public the panels highlight the history of the pool, its staff and some of its four and a half million visitors. The art deco style pool, which was built following the wishes of Alice Clark (1875-1934), opened to the public for the first time May bank holiday 1937; Greenbank Pool has opened for the summer season the same weekend every year since. On hot summer days before the pool opened members of Street community swam in the nearby River Brue. As the men and boys were inclined to swim naked the women and girls were reluctant to swim with them and it was Alice Clark’s wish to provide ‘a nice swimming bath generally available for women and children’. After Alice’s death, and in accordance with a memorandum accompanying her will, Alice’s sister Dr Hilda Clark and nephew William Bancroft Clark turned to Karl Hinde and C & J Clark Ltd.’s building department to design and build an outdoor swimming pool. Run as a registered charity the pool has survived through some difficult British summers through the generous, and very gratefully received, aid of a grant from the Street Parish Council, a trust fund left by Alice Clark and of course the entrance fees received from the thousands of visitors who use the pool each year. The panels can be seen in the Games Room at the Pool. This summer Greenbank Pool opens weekdays from 12 noon to 6.45pm and 10am to 6.45pm at weekends until September 14th.